By buying this product you'll earn up to 1920 Rewards points. The Cinema Contour series is Da-Lite's finest fixed-frame screen design. This model, with its perforated screen, will please the most demanding videophiles and audiophiles. In a movie theater, the illusion of reality is enhanced by having the front speakers positioned behind the screen. Da-Lite's perforated screen lets you enjoy that same heightened realism in your home theater. This screen features perforated fabric, which allows sound to pass through the screen. You can place speakers behind the screen with virtually no loss in sound — or picture — quality. Since this fixed-frame screen is designed for wall-mounting, you can install in-wall speakers behind the screen and enjoy clean sound and a clean look. A perforated screen is a great option for home theaters where a very realistic soundstage is a priority. This screen features Da-Lite's HD Progressive 1.1 Perf surface. The screen gain of 1.1 makes it ideal for applications that require a small bump in brightness due to screen size and projector brightness. Formulated for high-resolution projectors, this white surface provides true color and exceptionally wide viewing angles. Overview: The Da-Lite Cinema Contour is a fixed frame, non-retractable projection screen. It has a 45° angle cut aluminum frame to give it a sleek, modern appearance. It is designed for mounting on the wall, or into a wall opening. The frame features the Pro-Trim finish, a black fabric covering that enhances the appearance of the screen, while it absorbs light surrounding the viewing area. It comes with the HD Progressive 1.1 Perf screen fabric. Screen Surface: The HD Progressive 1.1 Perf screen surface is ideal for situations where a small increase in gain (factor is 1.1) is needed due to screen size or projector brightness. The white surface produces true colors and uniformity with a very wide viewing angle (+/- 85° from center), excellent for large audiences. The screen fabric has specially-designed perforations, which allow you to install speakers directly behind the surface. There is virtually no sound loss, and the soundstage is more realistic. 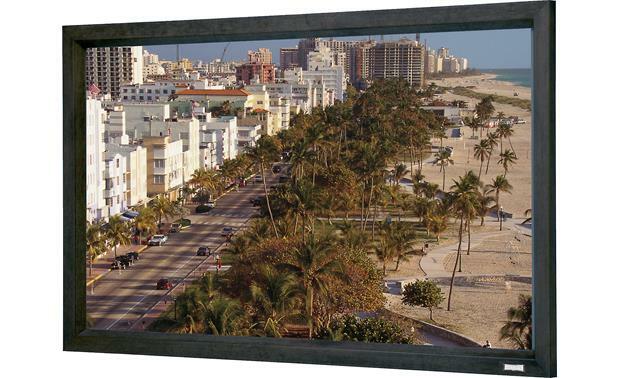 Installation: This Da-Lite projection screen is designed to be permanently wall-mounted. The frame comes in four pieces, and must be assembled. In addition, two wall-mount brackets are included, one each for the top and bottom. Enough hardware is included for assembling the frame, fastening the viewing surface, and attaching the wall-mount brackets. The screen does NOT include the hardware for securing it to the wall. It is recommended that the wall-mount brackets be secured to wall studs. do you sell just the fabric for a Da-Lite Cinema Contour Deluxe screen.....replacement fabric? Searches related to the Da-Lite Cinema Contour 20387V Fixed-frame projector screen with acoustically transparent perforated fabric.